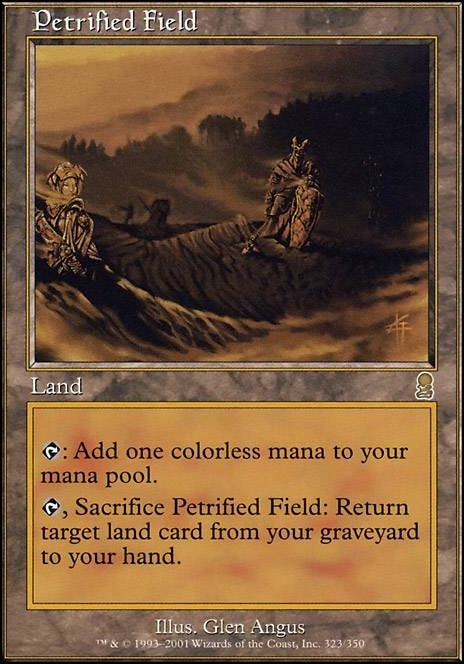 Tap, Sacrifice Petrified Field: Return target land card from your graveyard to your hand. Lotus Vale and Akroma's Memorial are definitely on my radar, but I feel like the beacon is more important at this point, the memorial is definitely awesome though. I also used to run Natural Balance , but I too often found it sitting in my hand for too many turns in a row, so I ended up cutting it. 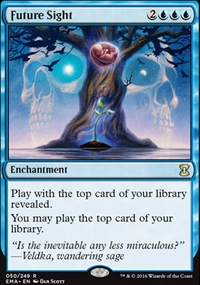 I was interested in your Squirrel Wrangler inclusion, I hadn't considered it with Gaea's Cradle , the combo with Growing Rites of Itlimoc Flip is cool, but it's not tutor-able like the cradle is to combo with the Squirrel Wrangler , do you find the wrangler to be good on it's own without the cradle as well? Ah yeah, that's a good reminder! Petrified Field was out of stock last I time I ordered and since then I just kinda forgot about it. I'm definitely going to pick one up together with the Command Beacon . Claws of Gix is nice to run alongside Sylvan Safekeeper and Zuran Orb for the sake of consistency. You have to pay mana into it, but it lets you sac any permanent. You can sacrifice your creatures, mainly Titania, should an opponent try to steal her. My pet favorite sac outlet is Squirrel Wrangler . If you ever get a Gaea's Cradle , or even Growing Rites of Itlimoc Flip, it has a powerful synergy with both. Natural Balance is a "fair" Armageddon . I used to run it in my original build. Lotus Vale is almost a Scorched Ruins , but for colored mana. Deserted Temple and Petrified Field are also favorites of mine for their utility. Not to beat a dead horse, but I thought I'd bring up Shirei again (and my deck specifically, The Recursion Nightmare), just because I've actually changed it around a fair bit since last time. Workhorse , Harvester of Souls , Heap Doll , Myr Sire , Diabolic Revelation , Homeward Path , Mindslaver , Arcbound Reclaimer , Sorin Markov , Dictate of Erebos , and Coffin Queen are all out in favor of Midnight Reaper , Mausoleum Secrets , Skyscanner , Dusk Legion Zealot , Sensei's Divining Top , Cabal Stronghold , Petrified Field , Burglar Rat , Liliana of the Veil , Sanguine Bond , and Exquisite Blood . 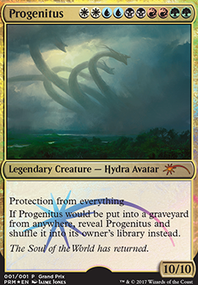 The wincons are stronger, the mana curve is lower (and more balanced), the cabal-tron package is now super-redundant (with Cabal Coffers , Nykthos, Shrine to Nyx Urborg, Tomb of Yawgmoth , Vesuva , Deserted Temple , Petrified Field , Cabal Stronghold , and Expedition Map ), the stax effects are stronger, and the utility spells are cheaper. I'd say the deck has gotten at least 12% better, which, admittedly, goes against what I said ealier about the deck being almost perfect (though, in my defense, I hadn't yet taken a good look at some of the cards they've been printing recently--that's the great thing about Shirei, he only gets better the more worthless black commons they release). I might take out the sanguine bond + exquisite blood wincon for Desecrated Tomb and Torment of Hailfire . Desecrated Tomb is more value, but obviously not really a wincon unless things are going way too well for me, and Torment of Hailfire isn't nearly as straightforward as Exsanguinate , but they might be better, anyhow. Also, I still stand by Damnation --especially now that I'm playing Midnight Reaper and Dusk Legion Zealot , my life total is kind of a precious resource--sure, toxic deluge might be worth it anyhow, but it also kills my commander (read: I get my board state back after a damnation), so it's not strictly worse--though, I might consider playing deluge over Oblivion Stone , even though that card is my one way of dealing with problem enchantments, for instance. Oh, and, I considered adding Pitiless Plunderer , but, again, the list is really tight, and I'd rather have Black Market over him, as I don't need more than one color of mana, the mana from Black Market accumulates, and it triggers whenever anything dies (relevant with Grave Pact ). Mesmeric Fiend has an O-ring trick going on where, if we sacrifice him before his first ability resolves, the second ability triggers and does nothing, then we exile a card from our opponent's hand permanently. Doing that every turn with a sac outlet can be pretty good, and if you do it for long enough, you'll have everyone topdecking. I used to play Brain Maggot in this vein, but later learned that that works differently--it's all wrapped up into one ability, so if he dies before it resolves, during resolution, we take a card, the game sees that it's dead, then we immediately return it to their hand. Not very good, obviously. Coffin Queen has a slightly different but effectively equivalent O-ring trick--if she's sacrificed before her ability resolves, the ability resolves, but since she's dead, the game doesn't remember her as an object and the delayed trigger of the ability can never happen, so we keep the creature permanently. When Coffin Queen comes back, she is, of course, a new object with a different timestamp. Oh, and, in case this one wasn't obvious, cards like Mindless Automaton work with Shirei because their power is 1 or less when they enter the graveyard, thus triggering Shirei's ability, and their power doesn't become more than 1 until they've already entered the battlefield, as per layering rules. Punishing Fire + Grove of the Burnwillows = allows you to Shock creatures on repeat. 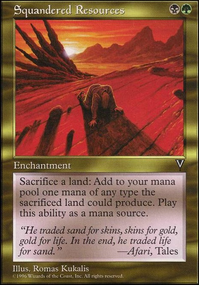 Deserted Temple + Rings of Brighthearth + any land that taps for 5 mana = infinite mana. Think Nykthos, Shrine to Nyx, Gaea's Cradle, or Cabal Coffers to get that kind of mana. I used to run Hour of Promise and I like the card. However, I ended up cutting it when other land tutors were printed. I think it was Pir's Whim that has taken its place. Constant Mists I also used to run, but I found that I did not run enough cards that synergize with it. I would probably put it back if I ever change the list to be more graveyard-oriented (similar story for Sylvan Safekeeper), or if my meta starts playing more aggro. It is a card I really like though, so I would like to run it again. Eternal Witness and Skullwinder are indeed great recursion cards! However, I run witness in so many decks already so I wanted to focus on lands in this list for my recursion cards for some variety. I prefer those recursion cards over witness and skullwinder. I never really read Realm Seekers well enough it seems :). Will reconsider that card! I’ve built this deck to make the lands shine! Magus of the Moon and Blood Moon turn the stars of my deck into mountains… I agree they are great cards for stalling opponents, but it goes against what I want to do with this deck. Also, I tend to steer away from cards that mess with my opponents' lands (already cut Jokulhaups for that reason). That’s also why I’m also not running Vorinclex. Yavimaya Hollow is useful, but not necessary in this list I think. I never really considered it for this deck however. So I will do that :)! I did not include Realms Uncharted in this list as I’m not focusing on graveyard synergy. But I never considered it in combination with Petrified Field, so maybe that will change things ^.^. 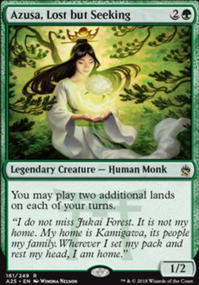 However, I do really like the land tutors that are already in the deck. Wheel of Fortune is awesome. However, I only have one of them, and I put that one in a Daretti deck, where it is more valuable for the deck strategy. Here I can run other carddraw and not feel bad about it ;). I don’t think it makes a big enough difference here to warrant that price tag. T&N I am already considering in this deck, but haven’t decided on it yet :). Insurrection is nice, but does not have any synergy here with the strategy or themes (I do run it in another deck where I think it is more at home). I agree Decimate and Gleeful Sabotage are decent removal options, but I prefer the removal pieces I ended up selecting for this list. You did see I only run 5 mountains right? I don’t see how Boundless Realms is going to kill all opponents with Valakut unless I have valakut copied a bunch of times and if I have a bunch of other cards in play as well that I don’t run. I actually wrote quite extensively about why I do not run Boundless Realms in my description and I stand by those arguments. Thanks a lot for dropping by. I will consider realms uncharted, petrified field, yavimaya hollow and realm seekers ;). Hour of Promise can either grab the full Dark Depths combo, or it can grab Valakut + T-Stage, which gives you a lot of options. 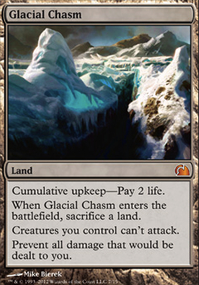 It can also pull out any other combination of helpful lands, like Glacial Chasm. Constant Mists is a way to take advantage of your mass of lands, and can let you stay in the game far longer than you have any right to with this card. Sylvan Library + Abundance is a pretty sweet little combo that lets you draw 3 cards per turn. Since Abundance "draw" triggers don't actually draw, but rather place the cards in your hand, as long as you trigger Abundance on all three Library triggers, you get to draw 3 cards. Both cards are obviously pretty good on their own too. Prismatic Omen drastically increases the power of your Valakut combo. Gratuitous Violence also helps with the combo, and drastically boosts the power of your tokens and beaters. Vorinclex, Voice of Hunger is just a stupidly awesome power-house. Not only does he double your mana, but he shuts down your opponents plays for as long as he's in play. Eternal Witness and Skullwinder are really great recursion effects. Realm Seekers often comes down with 15+ +1/+1 counters and can single-handedly set up any land combo you want. Magus of the Moon and Blood Moon are great for stalling out opponents. They have the side effect of turning off Valakut though. I run them in my R/G Borborygmos deck and they pay off more often than they mess you up. Petrified Field + Realms Uncharted forces the opponent to make bad choices, and almost always nets you your Valakut combo, or something just as beneficial. Wheel of Fortune is pretty great in here if you can get your hands on one. Tooth and Nail and Insurrection win games all on their own. Sylvan Safekeeper can help you keep your permanents safe while throwing lands in the yard for later use. Decimate and Gleeful Sabotage are amazing pieces of removal in these colors. The main reason to run Boundless Realms is as a win-con once Valakut is in play. It can often give you enough bolts to take out all of your opponents. I love your deck, love the thematic inclusions. I run a Muldrotha Lands deck, and some helpful glue card have been: Wayward Swordtooth. Exploration on a 5/5 body isn’t really terrible, especially at 3 mana. World Shaper has huge upside because it can fill your GY if they don’t choose to kill it, or put huge amounts of lands out should you chump block or sacrifice it. For example, after a Scapeshift, that’s incredibly powerful. Turntimber Sower. This card synergizes with Scapeshift, Titania, Gitrog, and can get you back key utility lands. Speaking of utility lands, Petrified Field, Command Beacon, Cephalid Coliseum, Bojuka Bog, and Halimar Depths are all lands worth considering, with your access to Harrow. I’d also consider Sylvan Scrying or Expedition Map to have even more. Last but not least, if you wanted to win the old fashioned way, Avenger of Zendikar teamed up with Craterhoof Behemoth usually does the trick. (No points for being original, though). Hope any of my suggestions have helped, keep up the great work!